Workers dismantling old blackboards at Emerson High School in Oklahoma City to make way for new whiteboards and Smart Boards discovered blackboards with lessons and drawings intact from November of 1917. Instead of being removed, they had been covered up with new “Slate Black Boards” installed by D. J. Gers & Co. We know this because janitor R. J. Scott signed and dated three of the old ones (November 30th, December 1st and December 4th, 1917) before the new ones were put in place. The new ones were larger than the ones they were covering so there are only a few holes and some adhesive marring the old blackboards. The writing, arithmetic and art are all in exceptional, like-new condition. 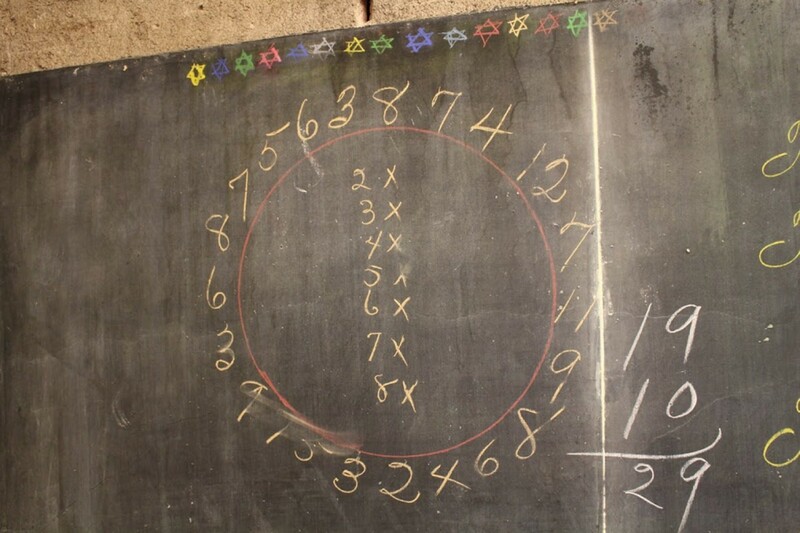 The 1917 blackboards were found in four classrooms. They wrap around the rooms, a blackboard perimeter surrounding students with learning. Lessons include addition, subtraction, simple multiplication on one board, a multiplication wheel on another, musical notation, in-class homework titled “Busy Work” with assignments like “draw a 5 in. square,” “Name 8 kinds of trees” and “How many pints in a half gallon?” A student has left us important hygiene tips in a list entitled “My Rules to Keep Clean” — “1. Wash my hands / 2. Wash my teeth / 3. Comb my hair” etc. — and there’s a list of names, probably students, next to some subtraction problems (Robert, Agnes, May, Sophia, Homer, Franco, Ray, Gladys, Mabel and Newton). The glory of the collection is the drawings, though. In bright colors, there’s a little girl in a blue dress blowing a soap bubble and another girl in a bright pink dress who I suspect is sprinkling salt on a turkey’s tail feathers. That’s the largest turkey, but there are at least two others. This being November, the first Thanksgiving was a recurring theme in all three class rooms. There are plain white chalk outline drawings of pilgrims and two mutli-color scenes of the Mayflower arriving at Plymouth, complete with Plymouth Rock marked 1620. The girl in pink with the salted turkey has her back to a calendar. It’s titled December but it’s actually a November calendar. That’s why Thursday the 29th is in red, because that’s Thanksgiving which was obviously a seasonal theme of the lessons. The class had just begun to change the dates to December — the title, the 1st-3rd of November erased and replaced with Saturday, the 1st of December — but stopped before they got to the second row. 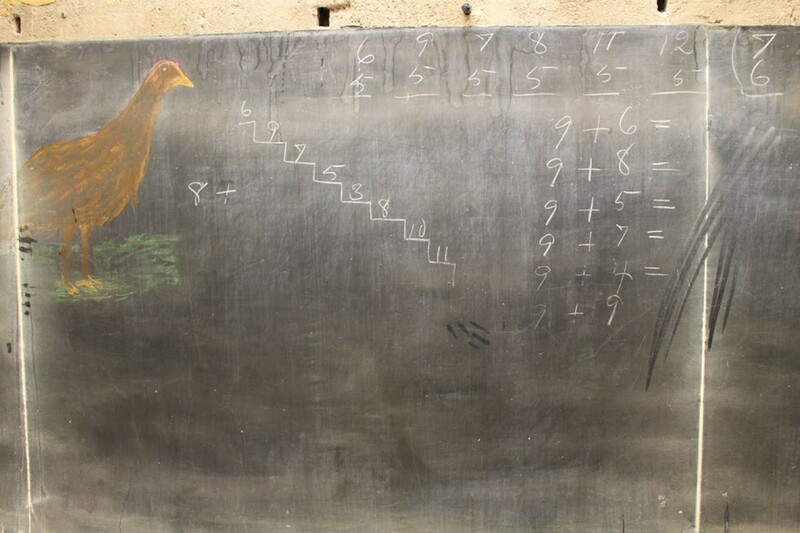 The origins of the classroom blackboard are shrouded in mystery. 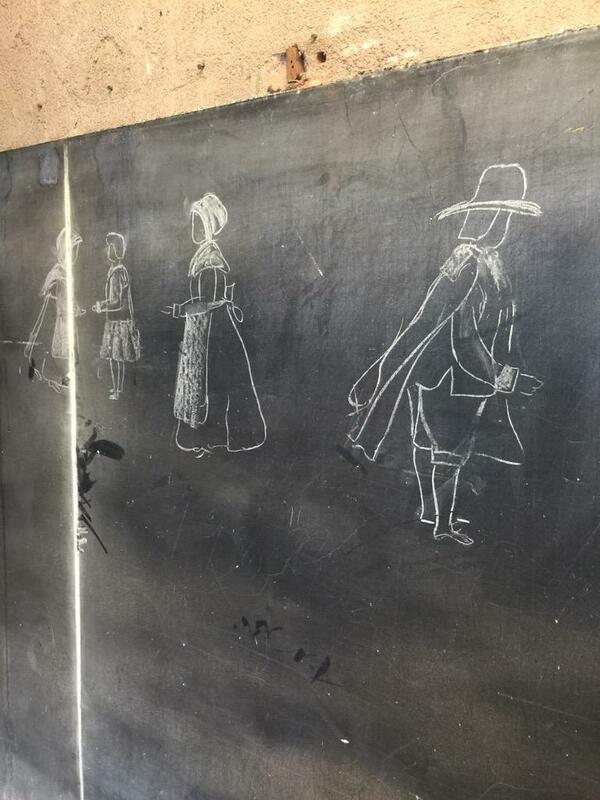 Individual erasable slates were used by students for centuries and larger boards used in the front of the class to teach music as early as the 16th century. There are documentary references to writing with chalk on a blackboard in mid-18th century England, but the first blackboard known to have been used in the United States was at West Point in 1801. President Thomas Jefferson signed the act officially establishing the United States Military Academy on March 16th, 1802, so they were still just getting their act together as a school for anything besides artillery training when the blackboard made its first appearance in the first class at West Point on September 21st, 1801. The teacher was mathematician George Baron who was English. He brought with him a standing slate board he wrote on in white chalk to illustrate his lesson for the 12 cadets that made up the entirety of the West Point student body at the time. Colored chalk may have first been used in class by James Pillans, Scottish classicist, educator, reformer and an early adopter of blackboard technology. He apparently had his own recipe for making colored chalk out of ground gypsum, porridge and dyes. Some sources also grant him the honor of having been the first to strap together individual slates to make one large enough for front-of-the-room usage, but that’s almost certainly apocryphal. Pillans was an undergraduate at Edinburgh University when Baron used his slate board and in fact actively resisted becoming a teacher until 1810 when he was elected Rector of Edinburgh High School and began to teach Greek, Latin and classical geography. In an 1814 letter to his colleague Mr. Fox, Pillans expounds at some length on the value of blackboard drawings with colored chalk for his classical geography class at Edinburgh High School. A sketch or outline of each country is drawn by the Master on a black board with white chalk; the mountains are represented in green, and the rivers in blue. In this state the board is first presented to the pupils and the Master, with a rod, explains the physical features of the country, points out and names the leading ranges of mountains, and the rivers that fall from them. The board as yet presenting so little detail, the eye, and the mind through the eye, readily takes in and retains the information. At this stage also the length, breadth, longitude, latitude, and boundaries are fixed. The next lesson presents the towns, (drawn thus # in pink chalk,) which are to be found on the rivers already learned, descending from the source to the mouth. These towns are demonstrated by the Master in the same way, care being taken to mention at the time some striking facts respecting the situation, inhabitants, history, or neighbourhood of each, which may be associated with its name and position on the board. Having thus made out a sort of skeleton or frame-work of the country, by presenting, in striking relief, without those details which confound the eye in maps, the great physical features, the next object is to mark out in dotted lines the artificial divisions : and when these are well fixed, the remaining towns of importance, whose position is not indicated by rivers, are referred to the province or shire, and associated again with those already known. The situations of great battles are pointed out by a cross in red chalk. The object being to make a strong impression on the eye, and to set the imagination and conception to work, the chalks being of different colours is a circumstance not to be despised. 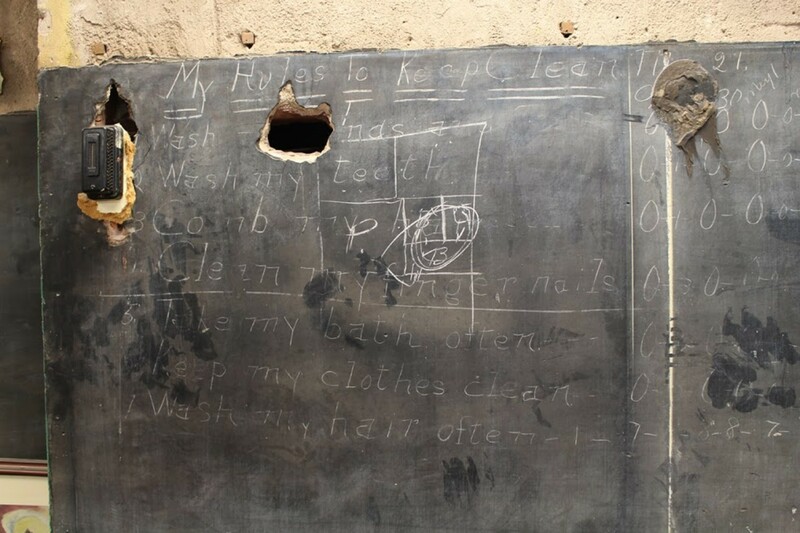 A century later, blackboard drawings as a pedagogical tool had moved far beyond colored maps for geography lessons. 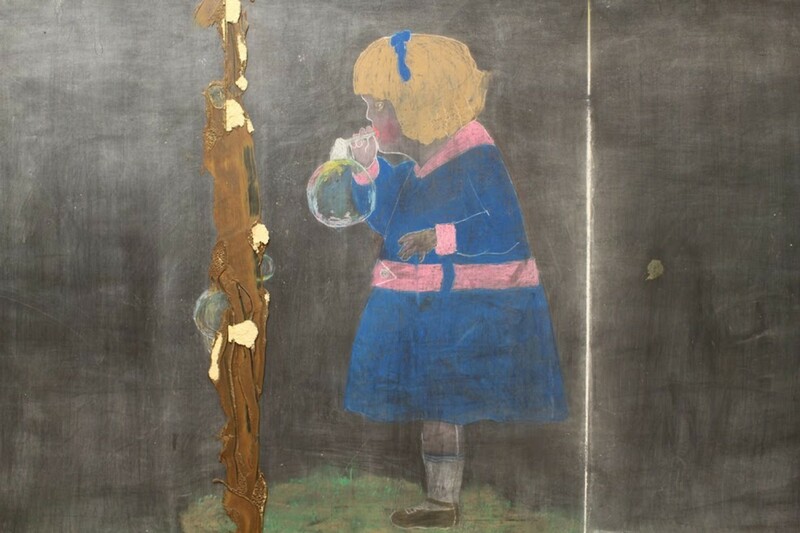 Blackboard Sketching by Frederick Whitney, Director of Art, State Normal School, Salem, Massachusetts, was published in 1908 to teach teachers how to make chalkboard masterpieces that would catch the eye of students bored with lectures. It’s brilliant and very short (a pamphlet, really), so be sure leaf through the whole thing. 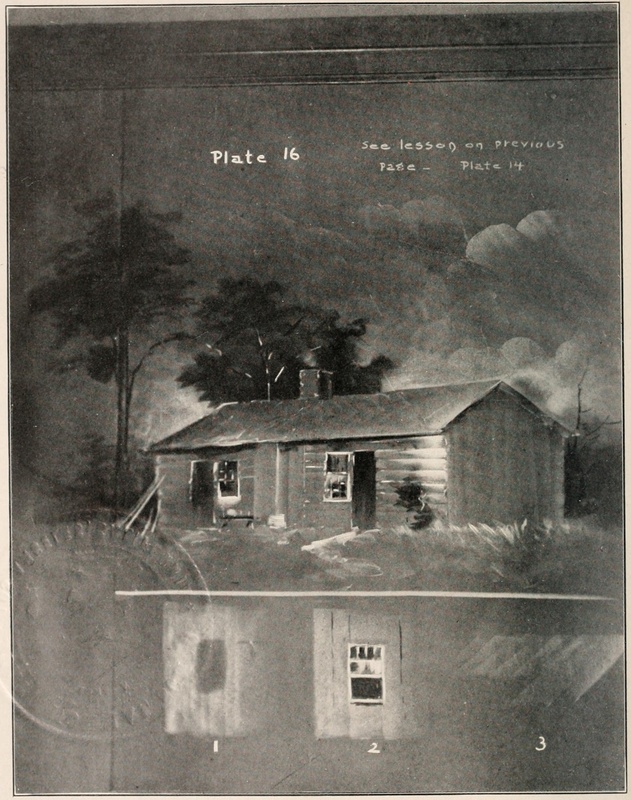 Quick correction: Whitney wrote in the instructions to Plate 14 that the log cabin in Plate 16 is Lincoln’s birthplace. It’s not. Abraham Lincoln was born in a one-room log cabin in Kentucky and spent much of his boyhood in another one-room log cabin in Indiana. The two-room cabin so adroitly drawn in chalk was his father and stepmother’s place near Lerna, Illinois. Lincoln was already a member of the Illinois House of Representatives when his father built that cabin in the early 1840s and visited it seldom. It was dismantled for display in the 1893 Chicago World’s Fair and was either lost or destroyed in a fire before it could be reconstructed. The current Lincoln Log Cabin State Historic Site is a replica built by the Civilian Conservation Corps in 1935 from photographs. 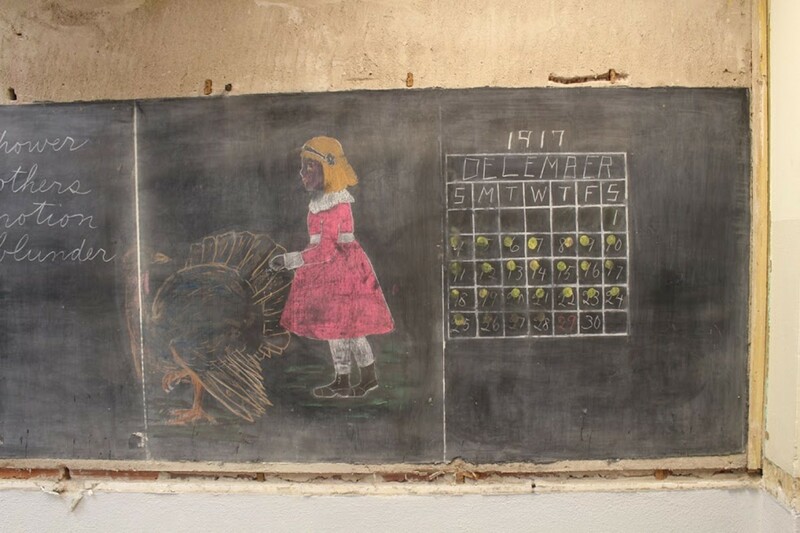 As for the Emerson High School 1917 blackboards, administrators are working with the school district on a preservation program that will keep these rare artifacts of the 1917 classroom frozen in time, if not in place. Here’s an extensive photo gallery and below is a news story with some great views of the blackboards and classrooms. This entry was posted on Monday, June 8th, 2015 at 7:09 AM	and is filed under Modern(ish). You can follow any responses to this entry through the RSS 2.0 feed. You can skip to the end and leave a response. Pinging is currently not allowed. 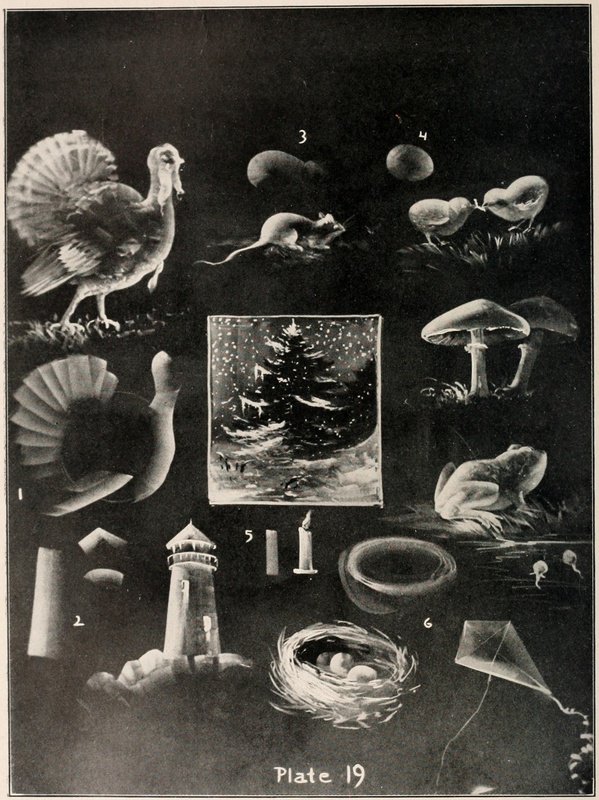 Oh my God, those illustrations in the book on blackboard sketching are fantastic! They are, aren’t they? They make me want to get a blackboard and give it a try. I’d throw caution to the winds and go straight for the castle. Yes! The teacherly cursive is beautiful too. I remember being so awed when teachers did perfect straight lines of cursive on the blackboard. I stuck to printing and the ends of my sentences always tilted downwards. How exiting! When the Robinhood Free Meetinghouse in Georgetown, Maine was purchased for renovation for a restaurant, they unearthed the last lesson on the blackboard in 1932. They covered it in plexiglass and it remains as part of the decor. So happy to see another discovered. That is so, so cool. Clearly I need to make my way to the Robinhood Free Meetinghouse restaurant. What is it called? Wonderful news. Thank you again for fascinating topics. The pleasure is all mine. Thank you for equalling my enthusiasm. This is an amazing find and peek into children’s lives a century ago. I’m perplexed, though, by the multiplication circle. It certainly isn’t familiar from my elementary school days, and I can’t see how it is supposed to work. What am I missing? Whatever you’re missing, I’m missing too. Not even the teacher in the news story had any idea how it worked. I wonder if it was some kind of problem or puzzle rather than a times table. The multiplication circle rings a very distant bell. I think my first primary school in the deep Scottish borders used it longer ago than I am going to admit. As far as I remember, the numbers on the outside of the circle were randomly selected to be multiplied by the numbers inside, each in turn. I cannot be certain, because I was a late developer (and the school was awful) and spent my early years greatly bewildered by anything not related to farming, animals, birds and so on. At least I was not as badly affected as the wee lad who sat beside me, who every day wet himself in distress at the larnin’. I hope the little chap caught up: suddenly, all in a rush, everything clicked around the age of nine; I shot up the class – at another school – and became quite the intellectual snob until university cured me of that. This is quite an awesome find! The penmanship was impeccable. Hopefully the school board finds a way to preserve this piece of history. Another Borderer here; in my primary school a ring of numbers would be drawn on the board. The teacher would point at first one, and then a second, and then a pupil, who had to give the sum. Then to a third number and a second pupil, who had to give the running sum. And so on round the class until someone made a mistake, who was then “given the strap” i.e. fetched a blow across the outstretched palm with a leather belt. By God we learnt our arithmetic, and improved our powers of concentration. P.S. This is presumably the school where Pillans was Rector, established 1128. This article is interested and I must to follow it. This is so beautiful. It’s like finding cave paintings. It’s better than a time capsule! A peek into the every day from almost a hundred years ago. Ugh. My word goodings go away. I agree and I think the word goodings served you just fine. it is nice but makes you think when you see the calendar, the numbers are off. missing two days. I actually explained that in the post. The class was in the process of replacing the November calendar with the December one. They had erased the title and the first week of November’s dates, replaced them with December and the 1st, but hadn’t gotten to the rest yet. What a wonderful find! I really enjoyed reading about this! The ‘Blackboard Sketching’ booklet is amazing. Certainly I never saw a teacher draw something so expert. I wonder if the techniques could apply to working with colored chalks on paper? Thanks to you and dearieme for explaining the Multiplication (math) wheel–I was going crazy trying to figure out the pattern or how it worked!! Fascinating! I love things like this, where something is preserved exactly as it was left decades ago.